Erick Ivan Luna, a 16-year-old Latino, was shot and killed Monday, Nov. 13, in the 8600 block of Rose Street in Bellflower, according to Los Angeles County coroner’s records. Erick was outside his residence around 8:30 p.m. when he was shot, according to Los Angeles County Sheriff’s Lt. Rodney Moore. A man in his 20s also was shot, Moore said, but he is expected to survive. 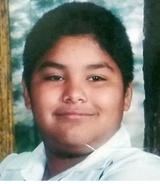 Erick, a special needs student at Buena Vista High School in Lakewood, was pronounced dead at the scene at 8:45 p.m., according to coroner’s records. Manuel Amaya, Erick’s cousin, told KTLA 5 News that Erick was walking on the driveway at the apartments where he lived when a car pulled up. KTLA reported that Erick’s mother was taken to the hospital with chest pains after learning about her son’s death, but she returned home later. Erick did not know the other man who was shot, Amaya said. He was standing behind the teen, and detectives are investigating whether he was the intended target of the gunfire. The office of Paramount School District Supt. Ruth Perez is collecting money to help Erick’s family. Checks should be made out to the school district, in care of Buena Vista High School, and mailed to 15110 California Ave., Paramount, CA, 90723. Note “Erick Luna” in the check’s memo field. — HoodHistorian Nov. 24, 2017 at 4:15 p.m.